The following nuggets of wisdom pouring light on this topic are from scientist Dr C N Manoj, Founder-Director of Pelican Biotech. I have collated all the information he has shared with me through emails and phone calls here. This should help you bust any myth about these menacing machines of various brands that have carved out a sinuous trail through urban concrete jungles all over India and arm yourself with scientific facts to put forth your argument in favour of sustainable composting methods. 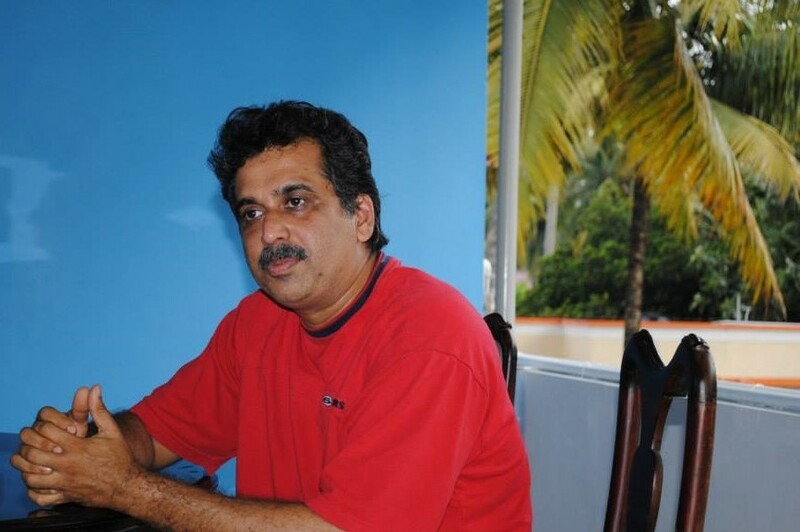 Dr Manoj is a biochemist, a rare kind with a deep sense of social responsibility. He is currently involved in large-scale projects in Kerala to bring about behavioural change among people to deal with the mounting garbage crisis. That he does by using carbon-neutral and carbon-positive resources to preserve and enhance the ecosystem we all inhabit. 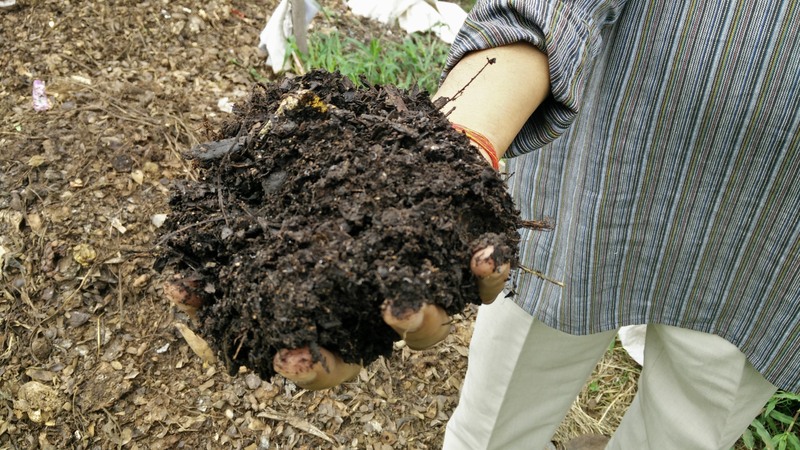 Composting is the breaking down of complex chemical molecules like carbohydrates including cellulose, fat, protein, lignin, etc., into simpler compounds (monomers/dimers) such that either the monomers form food for the microbes or facilitate their growth. For example, carbohydrates are the sugar source. Protein is the amino acid source. Degradation of lignin is very important for the microbes to sustain as lignin is created by Nature to protect the plants from bacterial infection. The standards of composting necessitates the presence of at least 2 lakh CFU microbes/cm of compost. This is to ensure that all the nutrients are converted to its ionic form which is the absorbable mode for plants. Irrespective of the quantity of waste, for quick incubation, a minimum of 2% microbial inoculum needs to be added to it. Thus for 1kg, 20 gms. It will take 36 hours for the microbes to colonise. Now the next question is, can we add the waste on the second day? Yes, we need to add fresh microbes as above. However, the third day, we have around 1kg of populated media which can be considered inoculum for 50kgs of waste. By the end of the sixth day, we have 50kgs of inoculum for 2,500kgs of waste. However, composting is a different scenario altogether. A completely inoculated waste will take at least 25 days to compost—when humidity and temperature are ideal—to an EC value of less than 20 millimhos. This is where it doesn’t match with the 24-hour machines. That means nothing happens in 24 hours. For inoculating, it takes 36 hours and for composting even 1gm to whatever quantity, it will take 25 days, minimum. That means the volume of the waste will start reducing only by the 20th day. Then how can I keep on adding 100s of kgs of waste into the same vessel? That means the volume is being reduced by some other mechanism. That is dehydration. Biological materials have 80% of moisture which is removed by the machine. What we get out is acidic inert material which will require rehydration and inoculation for composting. There is no microbe in this universe that can colonise in 24 hours. The minimum incubation time is 48-72 hours and it takes days to colonise and start degradation process. Maybe, 15-20 days. Thus, 24-hour machines do not compost. The 24-hour composting machine—let’s call it 24-hour ‘fryer’—simply removes water and other volatile components out of the organic material thrown into it for composting. There is no microbial proliferation. If packed and kept, it will stay as non-biodegradable matter. This will result in accumulation of non-biodegradable material in the soil surface which will progressively kill the microbial flora and fauna as there is no humus generated. Do microbes colonise if we keep adding waste to the 24-hr machine? Now an argument can be that the 24-hour compost machines actually do not empty out the product in 24 hours and we keep adding waste for the next 20-25 days and by this time, the microbes can grow. Even under these circumstances, the microbes cannot grow because of the decreasing moisture content. Thus the output of a 24-hour composting machine is just charred and dehydrated waste. Now the problem starts. If the waste was composted under natural conditions, the lignin content would have got degraded, reducing its EC value, hosting microbes, generating humus which eventually will become carbon dioxide to be absorbed by plants. In other words, the natural cycle. That’s simply not the case with the fryer. This output, once it comes in contact with water again, will start leaching out acidic phenols which will spoil the soil further. The material is similar to the lignin waste of pulp industry. The cellulosic component inside the vegetative matter will partially decompose due to heat and oxidation. But the phenolic matter—though it decomposes partially—will stay acidic. On the contrary, in conventional composting process, these phenolic materials are decomposed. Presence of phenolic matter in the soil will simply absorb all the nutrients and choke the plants. People mistakenly call this phenomenon, “heat”. The conventional composting process requires accelerated removal of carbon while most of the nitrogen remains intact. Whereas in the fryer, the organic matter—when heated up—will decompose protein faster and the resulting amino acids will release nitrogen gases faster. This is a huge waste of organic nitrogen. The current cost of organic nitrogen (at 3% content in compost which costs Rs 10/kg) is around Rs 300/kg. While the carbon-negative urea with 50% nitrogen will deliver the same quantity of organic nitrogen for Rs 50/kg. This will result in indiscriminate use of chemical urea which is killing the soil now. Organic nitrogen is the solution and it needs to be fixed into humus or as nitrates. Only one thing can fix it: microbes. Composting process should keep on generating humus. Humus helps microbes grow. Microbes help decompose organic matter to release nutrients. Nutrients get absorbed by plants. Plants release more organic matter. This is a dynamic organic cycle. The fryer puts a break to this process! By rehydrating, we make it sterile. With high EC value, phenols leach out which not only kill the microbes but also prevent decomposition of even dead leaves by blocking humus formation, thereby stopping electrolytic transfer of nutrients to the roots. The presence of phenols also adsorb cationic (positive-charged) micro-nutrients starving the plants, thus completely killing the soil. The result is equivalent to what happened in Punjab due to excessive chemical fertilisers. The product will not degrade till the material again gets rehydrated, natural ligno-cellulolytic microbes colonise it, degrade the lignin and allow the bacteria to compost. 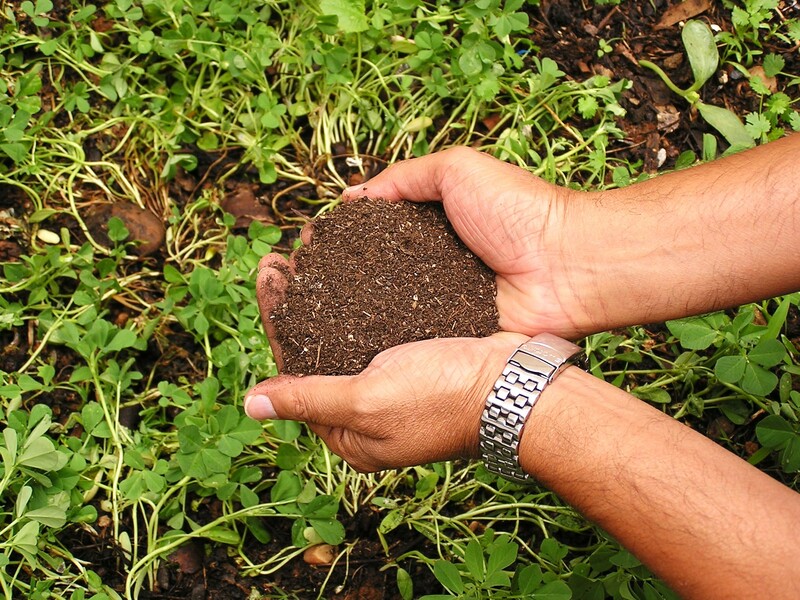 The whole idea of creating good compost with low electrical conductivity (EC) value is to enable people to start soil-less gardening and reduce carbon footprint. Fryers kill this purpose. This material has to be diluted by mixing with soil at least at 1: 500 ratio (24-hour ‘compost’ : soil) to enable cultivation into the media. We are not even talking about the power required to run these machines and the embedded carbon footprint. Irrespective of the input, the composting process should bring down the EC value to not more than 20 millimhos (actually, I prefer 10). The C:N ratio of the best compost possible is 20:1. Any further enhancement is only by chemical addition or by high nitrogen material like protein or because of dehydration. There are two effects. The first and the major one: It was meant to become humus to house microbes, but it is now converted into an inhospitable matrix. Secondly, its shelf-life. It can start composting in a few months. It will start leaching out phenols first, which will first kill the plants. The dump sites of such dried waste can be reclaimed in 2 to 3 years. That means we dry the waste and then carry out the processes as in conventional composting. Then why can’t we do it right now? Why do we dehydrate, then rehydrate and compost? What about those who keep adding it to the soil? They will never know. It’s like adding another ounce of toxin to the already piled up one. Irrespective of the technical arguments I have put forth, as a human being, I am appalled by the plundering of natural resources by humans. I may humbly add that any shortcuts taken by flouting Nature’s rules and regulations have only created havoc. Be it creation of waste or its management. The reason for this is the inability of an average urbanite to physically handle his own life’s byproduct due to “pseudo hygiene consciousness” and lack of physical health which necessitates more convenience. In every era, there were scientists and technicians who churned out such ruthless products, created market requirements by playing around the “convenience/automatic/quick mindset” of people. Unless we learn to work physically a little more, science will do what religion is doing now—kill people. If religion, which was supposed to create spiritual healing has created psychopaths, science is going to create couch potatoes who don’t want to move and kill themselves and also kill others (by preaching convenience). 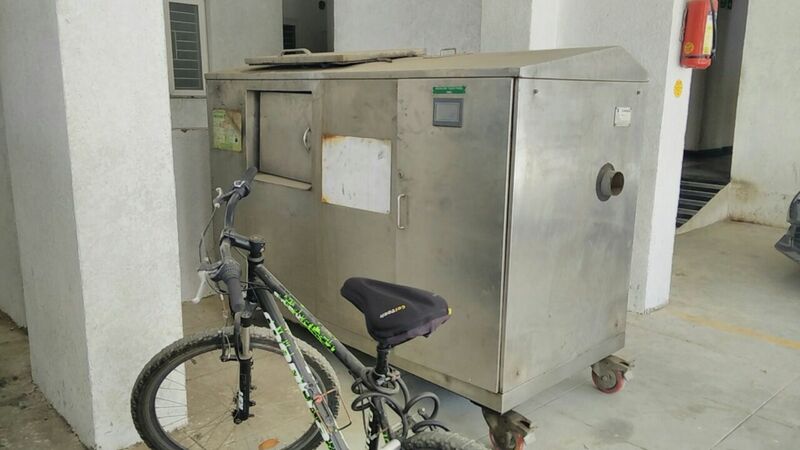 This entry was posted in 24-hr Composting Machines, Community Composting, Endlessly Green, Organic Gardening and tagged 24-hour composting, automatic composting machine, community composting, Dr C N Manoj. Bookmark the permalink. Excellent post Savita ! This must clear the mystery around the 24-hr ‘frying’ machines touted as composters. Nicely explained. Exhaustive study. Thanks ! Clear and precise reasoning to knockout Fast composting (24 hrs). Marketing drive may have got many such devices sold earlier. Hsg society/ assn do tend to pass resolutions to buy such machines at AGM to fast track the disposal of kitchen waste (organic). We need to spread the message to all Hsg complexes to keep off such machines. Thank you, Bikram. The only way we can spread the word is to first talk about it and let people know how destructive these machines can be. And then hope that the seeds of truth will fall on a fertile ground. Thanks for an informative article on a topic that has puzzled me for long. Excellent article that clears away all the cobwebs that let’s one see the reality of these “convenience” products being preached and preferred by myopic pseudo environmentalists. Thanks again not only to you but to Dr Manoj who let you into these secrets. A real eye opener Savita. Elucidated so well that even novices can comprehend. Thank you for the insight on the details. But recently I’ve been reached out by some company who claim to have a slightly different process where they would only heat it for like 4-6 hours depending upon the moisture content. After which they would keep the left over in open air for 5-6 days for dehumidification. They also claim that the soil test reports are much better than this burnt “compost” and can actually be used without harming the soil. Sorry, Karthik. I don’t see how composting can happen when it is heated using power without letting the microbes do their job and then leave it in the open air. It maybe, MAYBE, better than the burnt compost as they claim but that’s it. It cannot be called compost, I am sure. There are multiple sustainable options available. I suggest you take a look. Because many customers have been cheated by some claims as almost all the machines I have come across do burn the waste for a few hours. Caution’s the word as you will be spending a lot of money on these machines. Good luck. Dear Karthik, please read my latest post. Don’t fall prey to their claims. Some vendors have been showing around finessed/fabricated test reports to suit their needs.